Buy your paperback and eBook of Thirst now! Thirst is published in Australia and New Zealand by Hachette and in the UK by Constable. 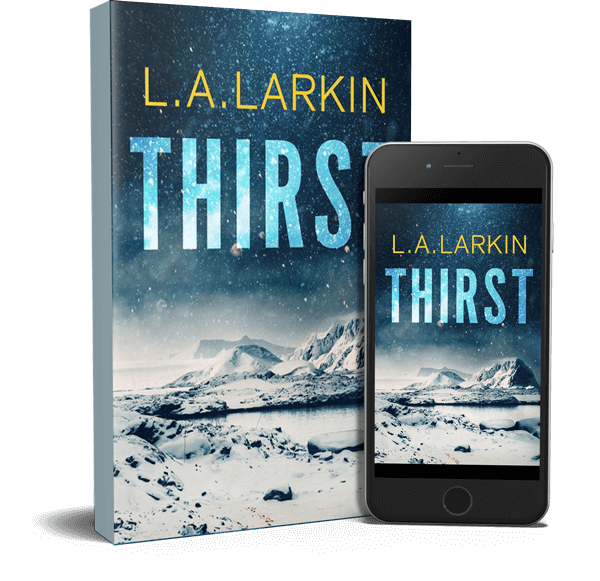 L.A. Larkin travelled to Antarctica to research Thirst. How does she bring to life the Antarctic environment in the story? Discuss the symbolism of the title, Thirst. What is Luke Searle’s character journey? What does he learn? How does the author present Luke as Antarctica’s champion and what skills enable him to fulfil this role? How is Robert a fitting adversary for Luke? Discuss Robert’s character arc and his relationship with his father? Discuss the challenges facing the two female central characters, Maddie Wildman and Wendy Woo. What are the themes of Thirst? How does the author create pace and suspense? What did you discover about Antarctica and climate change from the story?